Lasse Harrysson and MHF Hörby arranged Scale Nats. The 1/24 classes Production, Open 12 and Eurosport were raced on saturday and the 1/32 classes Formula and Eurosport on sunday. In Production Anders Gustafson topped the qualifying 4,895 and behind him was Lasse Åberg 5,506 with Mikael Gustavsson in third 5,534. In the main Anders Gustafson took the lead. After the third heat Michael Landrud went into the lead and held in to the finish. Production 1/24. 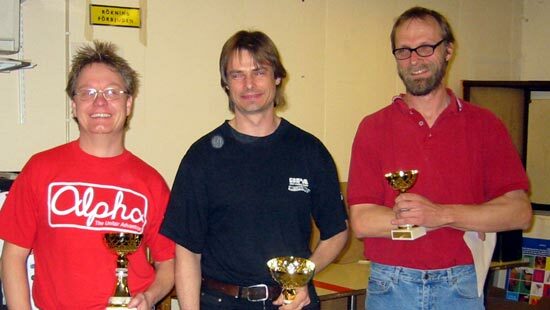 From left to right: second place Anders Gustafson. Winner Michael Landrud and third place Lasse Harrysson.